Charles Darwin's health improved substantially in 1866 under a dietary and exercise regime prescribed by his physician Henry Bence Jones. With renewed vigour, he worked steadily on his manuscript of Variation of Plants and Animals under Domestication, submitting all but the final chapter to his publisher in December. He also worked on the fourth, and much revised, edition of Origin which was delivered to printers in July, and preparations were begun for a third German edition of Origin. His improved health allowed him a more active social life. 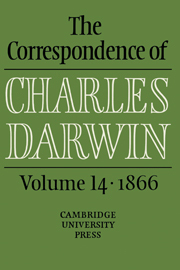 At Down, Darwin entertained a number of scientific colleagues whom he had known previously only through correspondence. He also made his first appearance in London scientific society in many years, touring the Zoological Gardens at Regent's Park, and appearing at a soirée at the Royal Society. List of illustrations; List of letters; Introduction; Acknowledgements; List of provenances; Note on editorial policy; Darwin/Wedgwood genealogy; Abbrevations and symbols; The Correspondence, 1866; Appendix I. Translations; Appendix II. Chronology; Appendix III. Diploma; Appendix IV. Presentation list for the fourth edition of Origin; Manuscript alterations and comments; Biographical register and index to correspondents; Bibliography; Notes on manuscript sources; Index.